Thyroid Hormone activity is regulated at multiple steps; however, the primary point of regulation is synthesis of thyroid hormones by the thyroid gland. Here we discuss the basic circuitry which governs release of thyroid hormone by the thyroid gland. Thyroid Hormone release is regulated by an extended version of the circuit that governs Basic Hypothalamic-Pituitary Coordination. The hypothalamus releases Thyrotropin-releasing Hormone (TRH) which acts on the anterior pituitary. It should be pointed out that TRH is also involved in the regulated release of prolactin. Upon being stimulated by TRH, the anterior pituitary synthesizes and secretes Thyroid Stimulating Hormone (TSH) which acts directly on the thyroid gland. Upon being stimulated by TSH the thyroid gland releases thyroid hormones. Recall from Thyroid Hormone Synthesis that the thyroid gland mostly releases T4 which does not possess much endocrine activity. Target tissues possess the enzyme Iodinase that converts T4 to either T3 or rT3. T3 possesses tremendously more endocrine activity than T4 whereas rT3 does not possess any endocrine activity. Therefore, in reality, the final step of the thyroid hormone regulatory axis can be considered to occur in the actual peripheral target tissues. TSH has multiple effects on the thyroid gland which increase thyroid hormone synthesis in the short-term and also increase the gland's capacity to make thyroid hormone over the long-term. 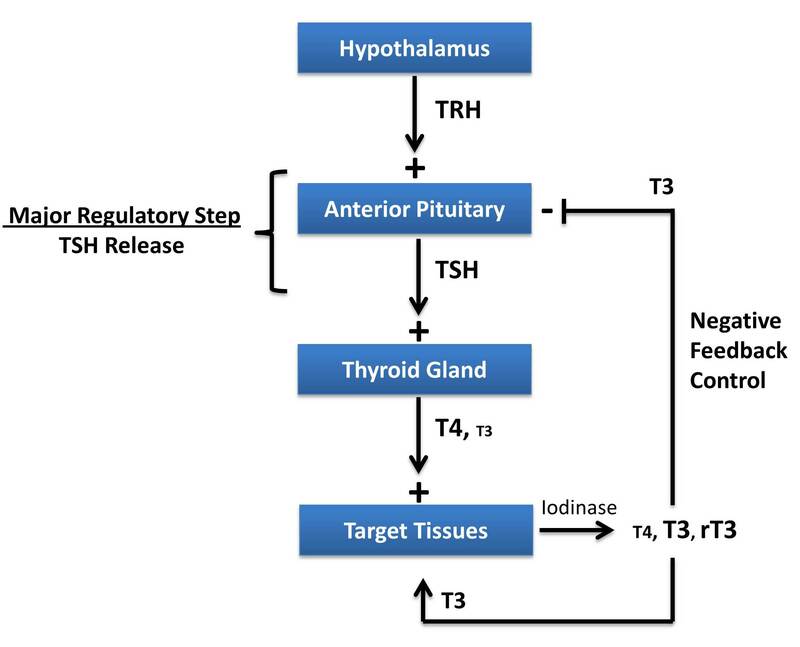 TSH induces immediate release of thyroid hormone by activating every step involved in Thyroid Hormone Synthesis but most importantly induces endocytosis of peroxidase-processed thyroglobulin. TSH improves long-term capacity of the thyroid gland to produce thyroid hormones by acting as a trophic factor, resulting in both hypertrophy and hyperplasia of the thyroid follicular epithelial cells which can be observed as gross hypertrophy of the organ. Importantly, excessive stimulation of TSH receptors, as occurs in Graves Disease, can result in thyrotoxicosis and inappropriate hypertrophy of the thyroid gland. The primary point of regulation for this axis occurs at the step of TSH release from the anterior pituitary. The primary factor which stimulates anterior pituitary TSH release is hypothalamic TRH. Negative feedback control is achieved when free, unbound T3 acts on the anterior pituitary to reduce the release of TSH secretion. For normal individuals, this regulation results in a fairly stable day-to-day level of circulating thyroid hormones. Recall from above that thyroid-gland derived T4 is converted into the much more active form, T3, by the enzyme Iodinase in target tissues. However, target-tissue Iodinase can also convert T4 to rT3 which does not possess any endocrine activity. The ratio at which T3 or rT3 is produced can be considered another, though less important, regulatory step in the thyroid hormone axis. Usually about equal amounts or T3 and rT3 are produced by target tissues; however, under certain conditions that ratio can change. For example during pregnancy, fasting, or certain disease states a higher ratio of rT3 is produced; in contrast during states of obesity more T3 is produced.